Mariano Rajoy removed as Spanish Prime Minister – Royal Times of Nigeria. 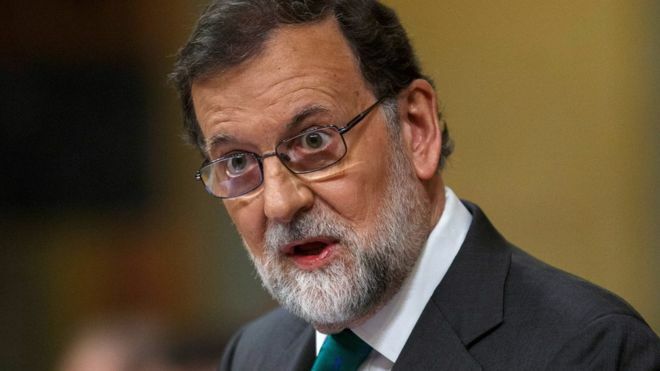 Spanish Prime Minister Mariano Rajoy on Friday has been forced out of office by a no-confidence vote in parliament sparked by fury over his party’s corruption woes. An absolute majority of 180 lawmakers voted for the motion, making Rajoy the first prime minister to be ousted in a no-confidence vote since Spain transitioned to democracy in 1977. Opposition socialist leader Pedro Sánchez, who filed the motion after Mr Rajoy’s party was implicated in a corruption scandal, will now become prime minister after securing a majority in the vote after gaining support from various smaller parties, including the Basque Nationalist Party. 180 MPs backed the motion, 169 voted against, with one abstention. Mr Sanchez said ahead of Friday’s vote, “We’re going to sign a new page in the history of democracy in our country,”. The leader of the conservative People’s Party has been prime minister since 2011.